Is it mythology or tradition that holds societies together? That’s the question posed by Aktan Arym Kubat’s Centaur, a profoundly moving tale about life in rural Kyrgyzstan that’s defined by its simple, heartbreaking approach. Ancient tales and folklore about the relationship between men and horses, and the customs forged over decades of social change are engaged in a constantly changing, ever-subtle dance in this wry drama. Kubat stars as Centaur, a former projectionist, turned construction worker, who lives a modest life with his deaf wife and young son in the bucolic mountainous region of Bishek. It’s normally a quiet village where nothing much happens but there’s a horse thief at large, whose been stealing local race horses, “riding them around like a crazy man” and then abandoning them, unharmed in the surrounding meadows. Centaur is a born storyteller. 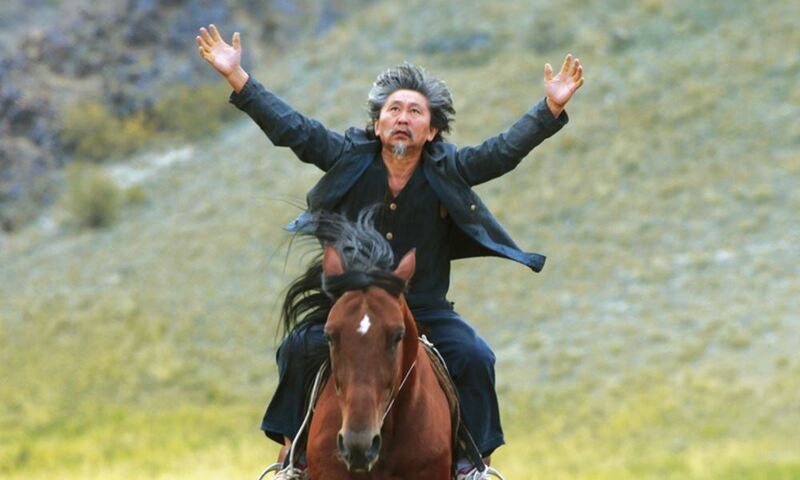 In some of the film’s most emotionally engaging scenes he can be observed regaling his son with old legends about how the people of Kyrgyzstan descended from the mythological half-human, half-horse creature he’s named after; believing wholeheartedly in the Kyrgyz proverb that horses are “the wings of humankind”. At night, Centaur sleeps under an old poster of the soviet film The Red Apple by Tolomush Okeyev, a memento of the days when he used to tell stories to the whole village. That was before the cinema he worked at turned into a mosque; one man’s place of worship replaced with another. He acts as a bridge between the past to the present, believing his stories contain a crucial truth, essential to understanding the world around him. Building on the success of 2010’s The Light Thief, Kubat once again makes excellent use of the endless, mountainous landscape of his homeland, using this breathtaking scenery as an ornate frame in which to mount this portrait of Kyrgyzstan’s conflicted identity. Pre and post-Soviet traditions clash with Islamic dogma, but for Kubat, no one individual’s beliefs are more important than the other, presenting an even and non-judgemental snapshot of this rural community. His camera has empathy for everyone, and even the film’s antagonists are shot with great sympathy and compassion. For Centaur, the legend of the horsemen becomes a way to retreat into a past where everyone shared what they had and people weren’t guided by greed and jealously. However, when it’s revealed that Centaur is the horse-thief, the atmosphere turns sour, with the villagers refusing to accept the sentiment behind his quixotic crimes, leaving the film to gallop wildly to the heartbreaking act that closes the film. The recovery of the lost past through the medium of storytelling, Centaur is a spellbinding film unclouded by romanticism but burdened with the emotional weight and tragedy of cultural erasure. The Berlin Film Festival takes place between 9-19 February. Follow our coverage here.